From very humble materials, I crafted a piece of Christmas decor that I really like. 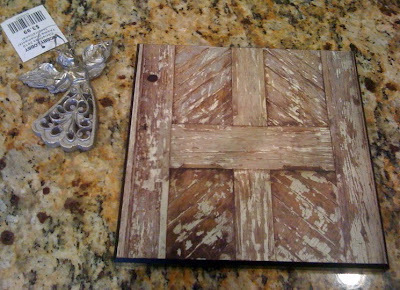 I had this plaque that I bought on clearance at Target for 99 cents, so that was the base for my project. A canvas or even a piece of foam core board would work as well. I found the pretty angel ornament at Hobby Lobby for half price, and I was on my way. I simply photocopied one of my favorite Christmas hymns onto a piece of parchment and glued it to my board. Do you know this hymn? The music was a little too small to cover the entire board, so I placed it over to the right. 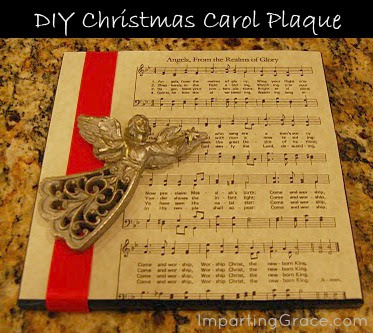 (If you were using a piece of foam core for this project, you could customize the size to fit your favorite Christmas carol.) When the glue was dry, I glued a piece of ribbon to the blank space and then hot-glued on my angel ornament. Voila! A piece of Christmas artwork! I like the way it looks on a plate stand sitting on the primitive sideboard in my dining room, although later I realized I should swap the red ribbon for something a bit more subdued. Yes. The gold ribbon works better. The possibilities for these plaques are endless. Other angel songs include "Angels We Have Heard on High" and "Hark the Herald Angels Sing." Maybe a star ornament with "O Little Town of Bethlehem" or "It Came upon the Midnight Clear." Or bells with "Joy to the World." Or a candle with "Silent Night." Or a snowflake with "Winter Wonderland," or even a piece of greenery with "Deck the Halls." What do you think? 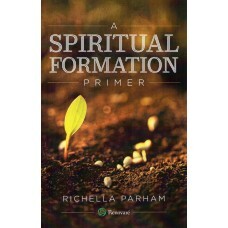 It's beautiful, Richella! 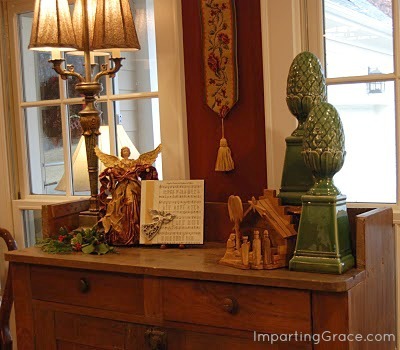 I love this idea...what would the season be without Christmas hymns? what a really pretty creation. Love the red ribbon & angel. What a great (easy) idea, it looks fantastic! Girl, I've got to steal-I mean borrow- this project. It's fabulous and so easy. I love modge podge because I can't mess it up. It's lovely, Richella! I know that song from a few Christmas albums we have, but I don't think I've ever sung it at church. Too bad...it's pretty. I love it, Richella!!! I think I have to copy this! So many possibilities. Thanks for the inspiration! I love it, love it, love it! I love that hymn too. What a great way to use your favorite hymn. Did I mention that I love it? Oh I love it! 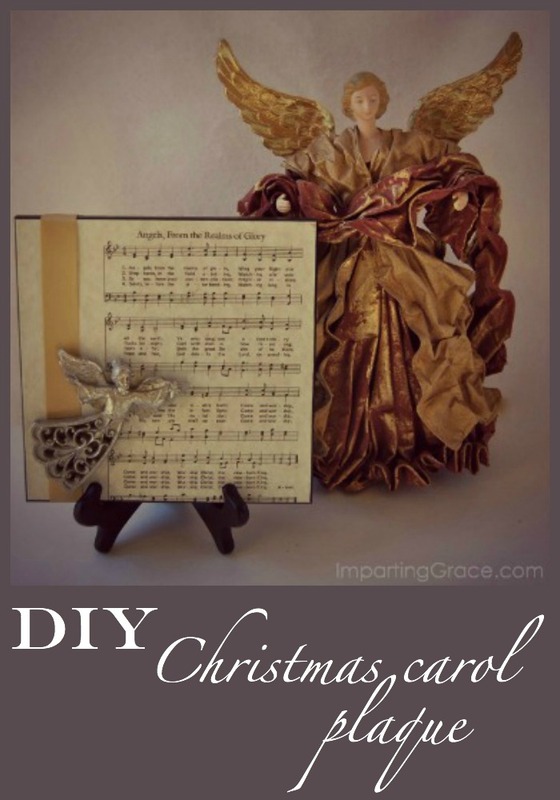 I have seen so many ornaments this year with sheet music...swoon!!! How lovely Richella, Christmas wouldn't be Christmas without angels and music! Such a sweet keepsake! Thanks so much for linking up! LOVE this idea!! What a wonderful Christmas gift it would make to give to friends. I think I would add a few, fun scrapbook embellishments, too! I am over here to steal, I mean try out, your pumpkin bread recipe tonight! I have a couple of Christmas tea posts up on my blog you would enjoy! I have a 3rd planned, but haven't finished it yet. Blessings!!! I really like this idea! And the hymn is a beautiful one. The men's choir at our old church used to sing it a lot and I loved it! You are so clever and creative! I love it! It is so beautiful Richella! I hope you are doing well. How is your finger? Oh, how pretty! I think where you have it is wonderful, but I agree with you that the ribbon might need to be changed. Maybe a burgundy ( because that's my favorite color?)? : ) And yes, I know that carol...I like Steven Curtis Chapman's version the best. And as far as Hobby Lobby goes, I love me some 50% off ornaments. I just nabbed three (because my husband would kill me if I got more) fleur de lis ornaments for tassels the other day...can't wait to start working on them. OK. I am totally going to copy your idea! I. Love. This. It would make such a great gift. My mom is totally getting a Christmas carol plaque from me for Christmas!! Thanks for sharing. This is GREAT! 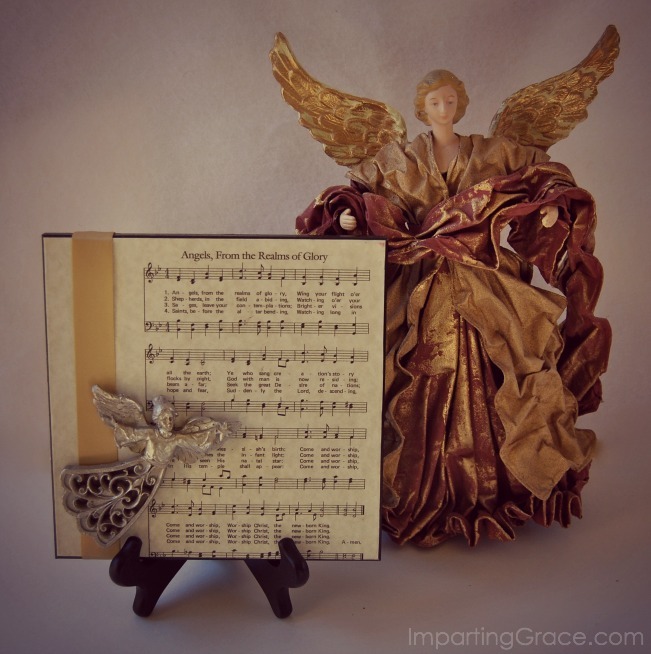 I love Christmas hymns and incorporated sheet music for one into our Christmas card. I'm going to need to use it for your project as well I think! Thanks! I really like this and the red ribbon adds to its beauty. That is lovely! Great project!